B&W is the inspiration behind the Lark-II. Just like the B&Ws, it has the tweeter sitting on top of the box. In the photo above, disregard the tweeter below the SB16PFC woofer. I left it there out of convenience. Saves me the trouble of cutting a new panel. Ever wondered why B&W placed their tweeters on top of the boxes?. It all has to do with Baffle Diffraction. No Baffle=No Baffle Diffraction. Meaning, better highs. B&W already knew this as far back as the 80s. 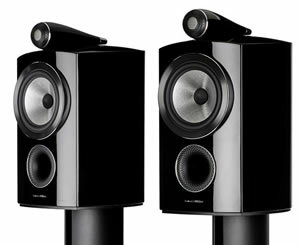 The iconic 801 Matrix had the tweeter sitting on top of an external mid-range enclosure. It remains a mystery to me why manufacturers are not embracing this method. Fig 1 – Mic at 1 meter, tweeter axis, 1/12th octave smoothing. Measurements below 400Hz are in Nearfield. The Black plot in Fig 1 is the Raw Response of the SB16PFC in a 15 liters bass reflex box with a baffle width of 8.5″. The response is flat all the way up to 3kHz. There doesn’t seem to be a rise in the mid-range due to Baffle Step. That is marvelous. No BSC network required, resulting in lower cost. The Red plot in Fig 2 is the TN28 with a High Pass filter. Note that there’s minimal baffle diffraction affecting the TN28. The Black plot in Fig 3 is the Lark-II frequency response. There are no sharp peaks or valleys. There are, however, a few dBs less from 3kHz to 7kHz. Because of this, the Lark-II sounds a bit “mellow”. Not DARK. Just a slight softening of the highs. This will suit listeners that find digital recordings too bright. Personally, I prefer the Lark-II. The TN28 is more to my taste. The BC25TG15 in the Lark sounds bright in comparison. The differences between the two tweeters are subtle but to discerning listeners, they can tell the two apart. The Lark-II is pleasant to listen to. Voices come out clearly without any veil. There’s no boominess in the bass. Most important, the bass is not lethargic like the Silver Flute W17RC. For those on a tight budget for a 6″ 2-way, the Lark-II is the choice. It offers the best performance at the lowest cost.